Through the centuries, the Copts (Christians of Egypt) have been among the more meek of dhimmis, rarely raising their voices in protest against their restricted lives, and this has been especially the case through the difficult twentieth century. But when Copts leave their ancestral homeland, ending up in North American, Western Europe, and Australia in particular, they find their voice. They take out advertisements, organize rallies, lobby, and hold conferences. Panel at the The First International Coptic Symposium, Sept. 23, 2004. 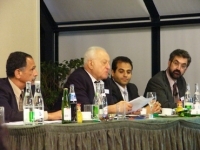 From the left: Youssef Sidhom, Adly A. Youssef, Michael Meunier, Daniel Pipes. the first reaction of the government was to remove three lines of phones and fax from my Cairo office. The office is in my name, but I have only hold a 5% ownership in it, so it belongs mostly to the other partners. When we asked the authorities what the matter is, their answer was that they are installing "Humayuni lines instead of the fax and telephone lines"! Oct. 11, 2004 update: The telephone, fax, and internet lines to Adly Youssef's office in Cairo are up and working today, after sixteen days of "repairs." Good for the Egyptian authorities.